MongoDB is one of those NoSQL databases that has gathered popularity quickly. Even if you are a little skeptical about the NoSQL movement, some time spent with MongoDB will be a good experience. Especially when you learn that it is an open-source project, and is supported on all of the major operating systems. It should come as no surprise that a number of PaaS options have appeared for remotely hosting MongoDB. The one I am going to introduce you to in this article is called MongoLab. There is a free account option available. You get 240MB on a shared account, and it can be hosted on Amazon, Rackspace, or Joyent. There is also the option to scale up, should your needs grow. 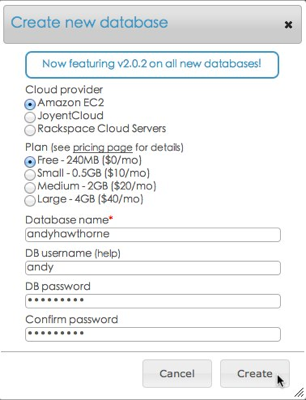 You get a web admin area that shows you an overview of your databases, users, and collections. It also shows you the required connection strings so that you can connect to your database via the MongoDB shell from your own machine. It only takes seconds to sign up for a free account. Just go here to sign up and you’ll be up and running in no time. You will need MongoDB installed on your own computer. There are various options you can use, and they are described in detail on the MongoDB website. I recommend that you follow their instructions for creating a data directory. I have installed MongoDB on several different machines, and the process works as detailed every time. If you use a Mac, I suggest that you download the 64-bit binary release. I have used that method on several different machines and it just works. You can place the folder anywhere you like; I put mine in my home directory to make it easy to call the bin folder from the terminal. There are MongoDB drivers for all the popular programming languages. If you want to work with PHP and MongoDB as detailed in this article, you will need to install the Mongo PHP drivers. There are drivers available for all the main operating systems. Other programming languages are also supported. If Python is your thing, for example, then you will need to install PyMongo. … without getting any errors. This tells you all is well. Once that is done, your database will be ready for you to connect to. 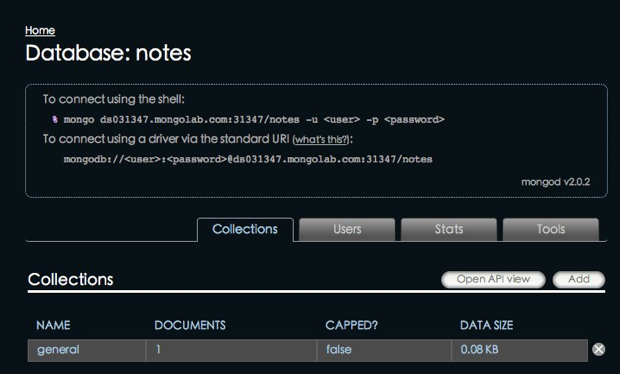 It might seem strange at first, but to connect to your MongoLab account, you will need MongoDB running on your own machine. Once you have it running, you can then connect to your MongoDB instance on your MongoLab account. I recommend that you use the shell access method since the standard URI method is not yet supported by all drivers. One of the nice things about MongoDB is that you don’t have to define data structures first. We can just go ahead and start creating records in the shell. 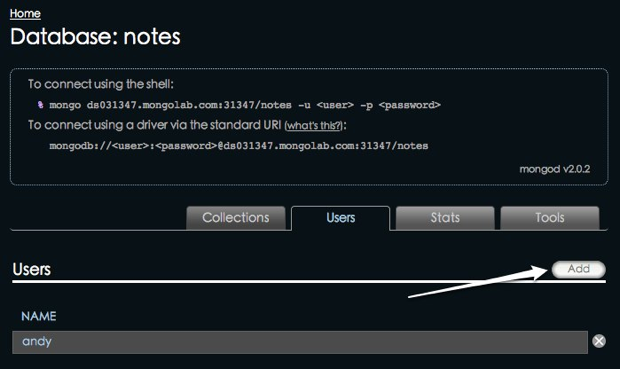 We will then be able to view those records in the web admin area of our MongoLab account. When you hit return, your record will be saved. What has happened at this point is your collection has been created in the database you are connected to, and your document has been saved to it. With MongoDB, a collection is contextually equivalent to a table, and a document is equivalent to a row in more traditional databases such as MySQL. Go ahead and add a few more documents in the same manner. This assumes that you have managed to install the MongoDB PHP drivers for your local system. 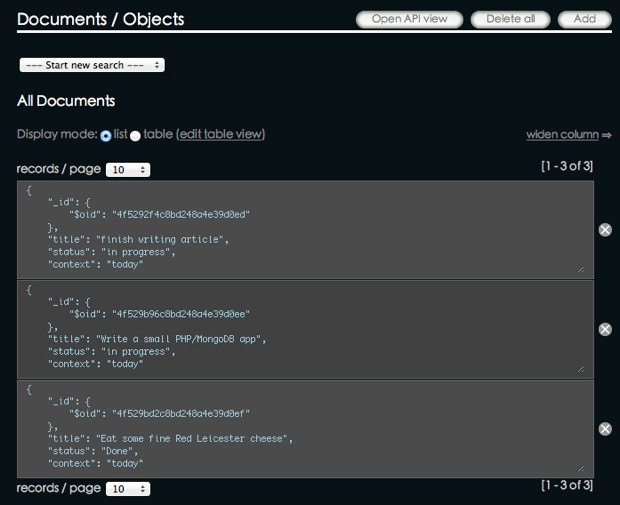 That line of code uses the MongoCursor method to retrieve all the documents in the collection. Again, if you have spent much time with PHP, this should look fairly simple. We use a while loop to iterate through the returned documents, printing out the data held within them. Notice that the PHP class has hasNext() and getNext() methods specifically for that purpose. You can read more about the PHP MongoDB class here. Hopefully this article has whetted your appetite enough for you to have a serious look at MongoDB. MongoLab is an excellent service that provides cloud-based access to MongoDB, and runs very quickly indeed. Provided that you get everything installed correctly, you can be coding apps that connect to MongoDB using your favorite technologies in no time. In the next article, we’ll expand on this simple app, and add the C, U, and D parts of the usual “CRUD” operations we use with other databases.